If your friends and family are anything like mine, they are flooding your Facebook feeds with Songza playlists. Here in Canada, Songza isn’t just a music streaming service – it’s a phenomenon. According to Songza, 2.4 million Canadians actively listen to Songza’s expertly curated playlists with iOS being their largest mobile platform. 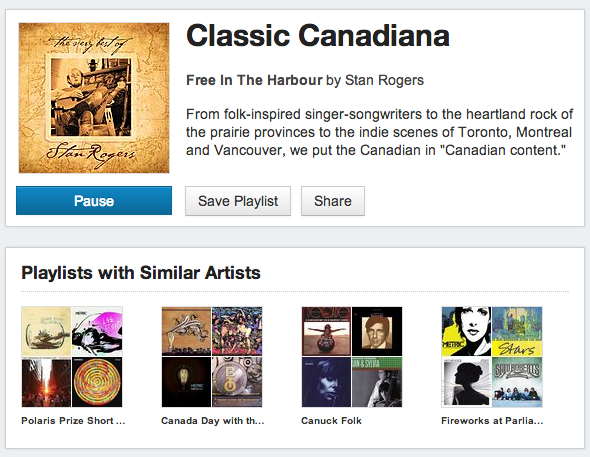 Songza also indicated that Canada makes up around 40 percent of their total active user base. Canadians love Songza. And today, Songza is sending their love right back over the border by announcing the launch of Songza Canada Inc.
Songza Canada Inc. is the first international setup for the New York based company. The Canadian arm will focus on increasing Canadian Songza users as well as increasing the value for these users through partnerships, ‘guest curators’ and better local curation. “We saw Canada as an incredibly important region for us for a number of reasons: great broadband and smartphone penetration, very tech savvy, and a solid amount of shared cultural and musical heritage,“ Songza CEO Elias Roman told BetaKit. Songza Canada will be based in Toronto. The team will be led by Managing Director, Vanessa Thomas, who for the past twelve years ran Nielsen Music North American Sales following years of music industry experience in California, New York, Nashville and Toronto. Canadian curated content isn’t a new thing for Songza but with the launch of Songza Canada we can expect to see this get an even bigger boost. Roman told BetaKit that we can expect more Canada-specific content for holidays, unique aspects of Canadian culture and content from more Canadian ‘Guest Curators’ making playlists on Songza. Past curators have included Justin Bieber, Michael Buble, and the Vancouver Canucks. I’m a big fan of Songza and I’m glad to see them embrace Canadiana culture.It will great to see them increase both French and English playlist and why not a mix of both for a true Canadian taste.